How Much Calcium & Vitamin D Does a Woman Need to Take? 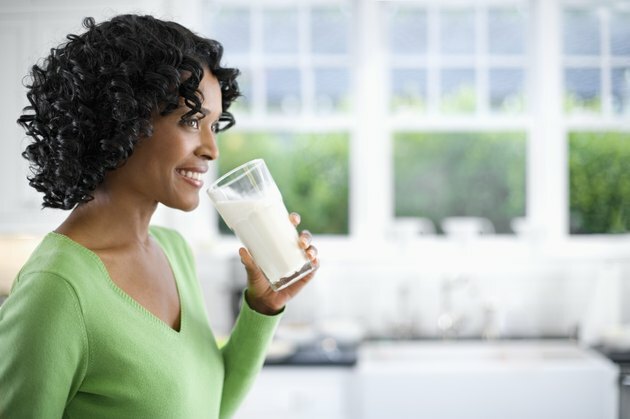 It's never too early -- or too late -- to make sure you get enough calcium to prevent osteoporosis or delay progression of the disease if you already have it, according to the National Institutes of Health. And while you're at it, don't neglect vitamin D. Even if you consume plenty of calcium, your body can't absorb and use it if you don't get enough vitamin D.
A small amount of the calcium you consume is used outside your bones for life-sustaining jobs, such as triggering nerve impulses and stimulating muscle contraction. If you don't consume enough to maintain a steady level of calcium in your bloodstream, your body takes it out of your bones. A second natural way your bones may lose calcium is through a process called remodeling. Bones reach their peak mass and strength between age 20 and 30. After that, they stay strong through ongoing remodeling, which removes old bone and replaces it with new bone. Beginning at age 19 and continuing until age 50, women should consume 1,000 milligrams of calcium daily, according to the Institute of Medicine. This is also the recommended dietary allowance, or RDA, for women above age 19 who are pregnant or breast-feeding. Once you turn 51, the RDA increases to 1,200 milligrams. As long as your daily diet provides enough calcium to meet your RDA, you probably don't need a supplement unless it's under the advice of your health care provider. The two most common forms of calcium supplements are calcium carbonate and calcium citrate. Calcium carbonate supplies double the amount of elemental calcium, but you must take it with food for it to be absorbed. Calcium citrate contains 21 percent elemental calcium, and you can take it with or without food. The more calcium you take at one time, the less your body absorbs, so the University of Arizona recommends taking no more than 500 milligrams at one time and spreading doses out over the day. Don't consume more than 2,500 milligrams of calcium daily because excessive amounts may lead to potentially serious side effects. Your skin synthesizes vitamin D from ultraviolet light, but many women don't produce enough through exposure to sunlight. All women, including those who are pregnant and breast-feeding, need to consume 600 international units of vitamin D daily. The RDA increases to 800 international units after you turn 70. Vitamin D is not naturally found in many foods, so breakfast cereals, milk and other dairy products are fortified. The Harvard School of Public Health suggests that the best way for most people to get enough vitamin D is by taking a supplement. The typical dose for vitamin D supplements ranges from 400 to 1,000 international units daily, according to MedlinePlus. But 400 international units is too low, and you may want to add an extra vitamin D supplement if your regular multivitamin does not contain 1,000 international units, according to the Harvard School of Public Health. Both forms of vitamin D used in supplements -- vitamins D-2 and D-3 -- are equally effective. Don't take more than 4,000 international units daily unless you consult your physician.